Inflatable collars provide a custom fit those who need options when using collars that are not available with traditional neck collars. In addition to both comfort and level of support, the cervical collars offer the addition of cervical traction, lifting the weight of the head from the neck and shoulders. The amount of traction differs for the different types of inflatable collars, along with options for control of each side individually. This can be beneficial for those who have scoliosis or need support for weak neck muscles. In general, they should not be applied with traction force to a recent injury to the neck. Some of the inflatable collars provide a great deal of traction design to relieve symptoms of degenerative cervical spine conditions, pinched spinal nerves and muscle spasm. Applying the collars to a recent injury could possibly cause more damage, so consult your heath care provider. When using these type of collars for support, you should only apply the amount of inflation to achieve a comfortable support and no more. The benefits are increasing support as the condition progresses and the ability to control the level of support as compared to a standard one size collar. 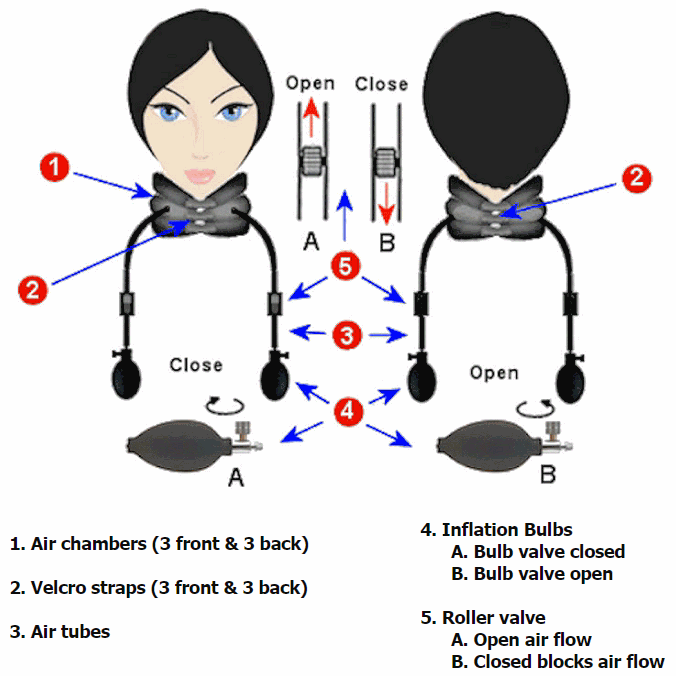 Most of these use latex in the collar itself and/or in the inflation bulbs. This collar will support the head in a comfortable manner. It is made from latex with a cloth covering for the top portion that goes under the base of the head. It uses 5 layers and offers individual sizes to fit from 11.5 to 21.5 inches. It applies approximately 70 pounds of traction force, raising to about 5.5 inches. Since it is completely made of rubber, it may have an initial strong odor, however, this will dissipate with use or with airing out. The air neck traction uses separate controls for left and right sides and is lightweight, using a soft covering around all 6 layers. It offers fitting for neck sizes from 12 to about 20 inches by using velcro attachments in both the front and back. Of collars, this one offers the greatest amount of traction force and height of the ones that have separate controls for left and right sides. It provides about 80 pounds of traction and raises to a height of about 9 inches. It comes with a carry case, an inflatable neck pillow. The traccollar is the most collar-like, with firm support when not inflated. It uses 2 inflatable layers and requires the least amount of pumping. That being said, it provides about 40 pounds of traction and raises to about 6 inches. Of the collars, this may be a bit difficult to apply for those with shoulder problems, as the adjustable velcro and buckles attach in the back, behind the neck. However, it provides the most support of the inflatable collars without any actual inflation. It comes in 2 sizes for neck sizes from 14 to 16 inches and 16 to 18 inches, includes a carry case. The chiropractic collar uses 3 layers to achieve a traction or lift force of about 75 pounds, raising to about 7 inches. It has a special feature for using an ice pack in the back and comes with one for reducing inflammation. This does not mean you should use more force of lift with the ice. It also uses a detachable inflation bulb system, where you can maintain the levels of support, without having the bulb attached and getting in the way of things. One should pay attention to the need for quick release of air when using this feature. It comes with an ice pack and carry case. Of the collars, this one uses 4 layers to provide a raising height of about 11 inches and a traction force of about 95 pounds. Because of the 4 layers, it provides the most comfort by allowing the most cushioning when using the traction feature. It is lightweight, easy to use and, while it provides the greatest force of lifting as well as height. So this offers the greatest comfort, however, requires the most amount of pumping. There are many different collar types and they are mainly designed to provide levels of neck traction, which may be beneficial for those suffering from cervical spine arthritis, herniated or bulging cervical discs, neck muscles tightness, cervical spine nerve irritation as well as irritation of joints in the neck. Therefore, in addition to using reasonable levels of inflation just for support, these collars have further benefit for rehabilitation once the initial stage of immobilization is done. When using for support only, inflation levels should be kept to a minimum, however, a custom level of support is achieved that is not afforded by single height, collars that are non-inflatable. The inflatable collars offer a wide range of application and level of support, providing options for future therapy benefits, therefore, they are a very versatile and comfortable method of applying support for the head and neck.